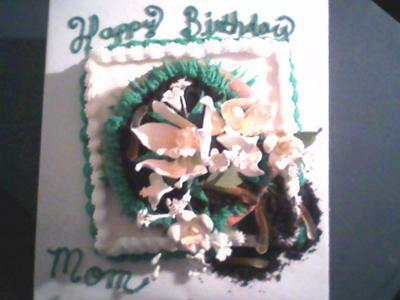 This flower cake was supposed to look like a shallow terra cotta pot with dirt in it, sitting on a cake. The 'pot' was 1/2 of the ball pan. I did cover the outside of the 'pot' in fondant. Inside on top of the cake was crushed up oreo cookies for the dirt. I had the premade flower I put in the center. I added gummy worms too. It was all buttercream and fondant. And the picture is terrible. I took this one with my phone. I accidentally deleted all the pix of it from my camera. Oops!